It's always fun to see how folks approach a similar style of beers differently, which is why this past years Milk the Funk Meet up at HomebrewCon was one of the highlights of the weekend for myself and many others. Got to meet so many folks in person that I've communicated with for years, but not only that, got to try the funky/sour/weird beers they brought as well. 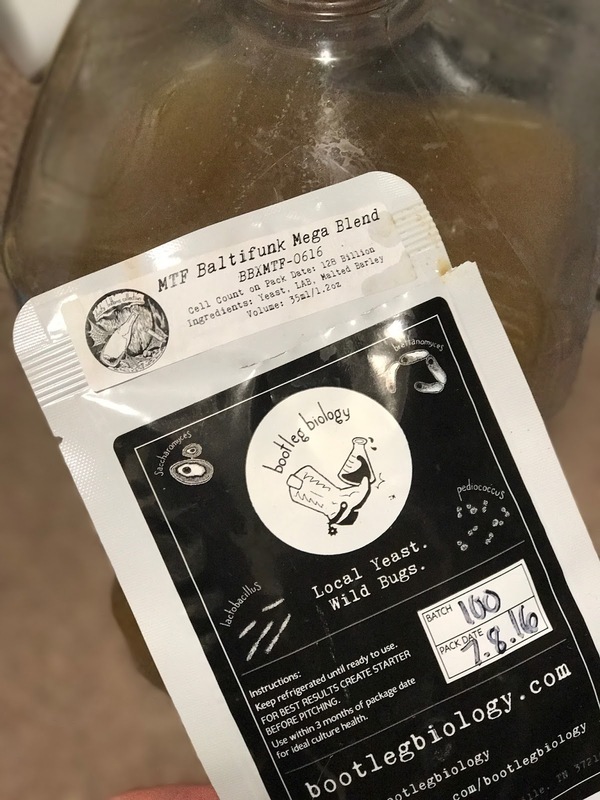 A few weeks before HomebrewCon I was chatting with Jeff Mello from Bootleg Biology about the meet up when the idea was floated to collect dregs of qualifying beers at the event to prop up as a one time blend. As the beers were shared in a super relaxed/disorganized setting, Jeff and his lovely wife Erin made their rounds sampling beers chatting up brewers and making a determination on what got selected for the soon to be dubbed MTF Baltifunk Blend. Something I, and many other sour beer brewers strive for in their mixed fermentation beers is a strong biodiversity in the culture. Whether that's being achieved by adding dregs of commercial beers to your wort or selecting strains that you have enjoyed in the past, for me its very important to, as Jeff says "cast a wide net" to encourage a complex fermentation profile. Which is why I love what Jeff said so much and also serves as confirmation for myself that the way I have been operating for years is in line with the thinking of a microbiologist who is much smarter than I. It has been a while since I got my hands on Jeff's Baltifunk Mega blend, it just fell by the wayside as I got things going over the last few months at Kelly Green Brewing Co. Which is a shame because most people will have used their by now, and the packs are all sold out but I imagine Jeff will do a similar thing at HomebrewCon next year so consider this worthy info for Fall 2017. I saw a lot of people on Milk The Funk and other Facebook groups asking what to do with their pack, to which I advised this very thing. 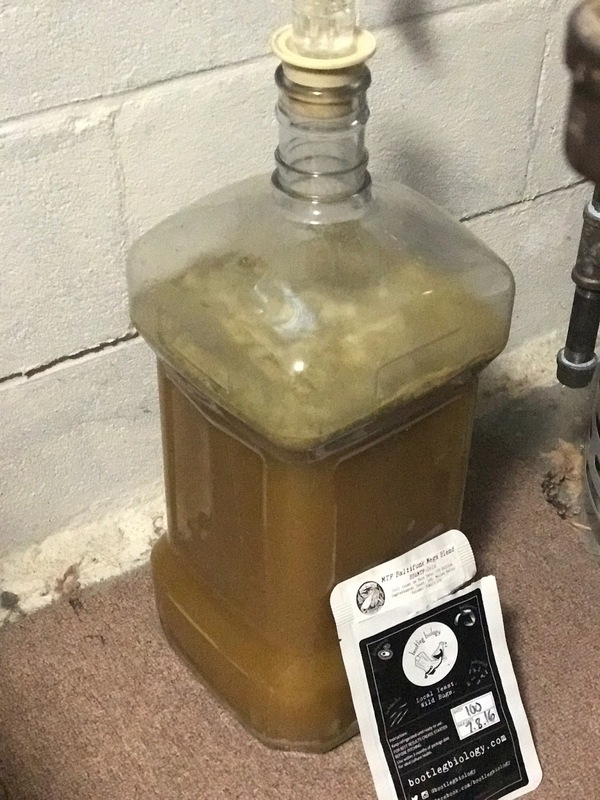 Use it as a base to start your own house culture, ferment out a simple wort, see how you like it and re-pitch that slurry generation to generation. Maybe add some strains you like to it over time to diversify further or hop the beer more to reduce acidity a bit, the options are really endless. But it seemed to me to be a great base to build your house culture from. I already have a house culture, that of the one we use at Kelly Green, but am always open to seeing what's out there to modify it or start anew even. When I approach a mixed fermentation beer its normally coming from a base of a Saison type wort, some folks go a different route but this is just my approach. Hops are higher than some people use in their sour beers but with that strong diverse culture you should still create some acidity over the long haul. I chose to go with a recipe I have been using for years, started as Farmer in the Rye and has been tweaked over the years. Its a perfect base for a mixed fermentation Saison, clean one, or even just Saccharomyces +Brettanomyces. Only time will tell if this year's Baltifunk blend fits the flavor profile I enjoy, but if the super funky aroma coming out of the package I opened is any indication I should be very happy in the end. 50ml of Imperial Organic Rustic slurry ~ since the pack was pretty old. Misc: Mash pH 5.31, Gypsum, Calcium Chloride, and Lactic acid added to the mash( 127ppm Ca, 6ppm Mg, 72ppm Na, 101ppm Cl, 100ppm SO4). Lactic acid was used to lower the mash pH, your water profile may vary. I used my Baltifunk back in July and just racked out of the barrel onto raspberries, cherries, and blueberries in separate carboys about 3 weeks ago. The SG was 1.004 and the beer had a nice tartness that wasn't aggressive or unpleasant in anyway. That barrel had already been used for two other beers each with a different culture so I basically took your advice here. Any recommendations of other good starting points (since this is sold out) for doing mixed fermentation saisons? I'm really interested in this and want a solid foundation for my first attempt. Imperial Organic Rustic co-pitched with propagated Lidemans Cuvee Renee dregs, if you have access to some other lambic dregs as well go for it. But just bc Cuvee Renee is a shelf beer doesnt mean its not good, plus their dregs are as good as it gets. Also the bottles are inexpensive.